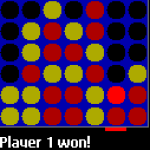 Connect4 is a free game for your mobile phone,blackberry,palm (j2me/midp1.0) and is a 4-in-a-row game. Name of the game is to get four markers in a row on a 7x6 sized board and is played by two players. Computer player uses a minimax search algorithm with alpha-beta pruning and iterative deepening. If you like it, also see the iPhone version that has network multiplayer support! Features: Play with a friend or against the computer. Change difficulty of computer player. Adjustable board size. Will work on any midp/1.0 capable device. Support for FullScreen on midp/2.0 devices. Swedish text if that is your setting, otherwise english.